Profile - Emerald Coaches - Moving People, Driving Excellence. If we pursue one goal more than another at Emerald Coaches, it’s to deliver our customers on time, in comfort and safely to their destination. Safety, and the responsibility vested in us, is something we have taken seriously for 30 years and something that drives much of our decision making. Our business is built on our diverse, highly trained team. We are investing in their skills and talent to better serve our customers. We employ local people and support more jobs through the supply chain and we also invest part of our profits in good causes and community projects. New ideas and new ways of delivering transport is what sets us apart from our competitors. Our focus on innovation is helping make our services more efficient, easier to use and more attractive to our clients. We have a successful track-record of working in partnership with government, transport authorities, local communities, and our suppliers on initiatives to make our services better. To exceed the expectations of our industry, customers, employees and the communities in which we operate. To create and maintain best practice in the management of vehicles, service to the customer and support and training of our employees. To exceed expectations in the implementation and management of our safety procedures and programs. Emerald Coaches is a regional bus and coach operation with experience over a vast geographical area. Emerald Coaches operates predominantly school, charter and specialised mining transport services in the Emerald, Mackay and Bowen Basin region of Queensland from depots in Mackay, Emerald, Coppabella, Springsure and Capella. 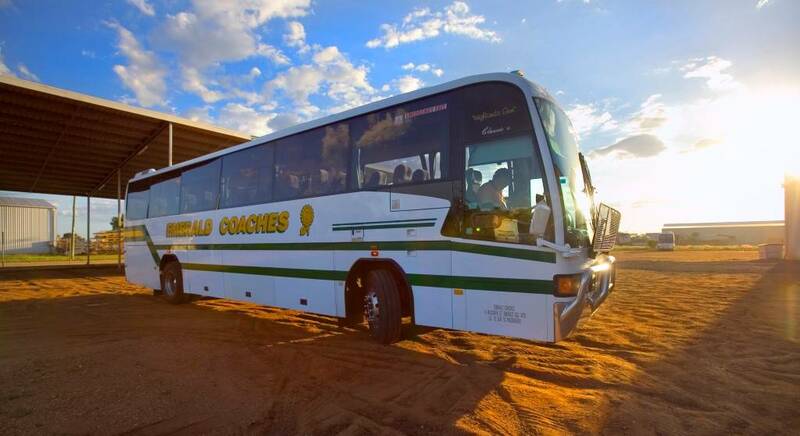 Emerald Coaches achieves results by providing best practice, cost effective and innovative transport solutions in often remote regional areas. The innovative ideas and progressive thinking of its employees provides Emerald Coaches with innovative procedures, improved services, increased customer satisfaction and ultimately, patronage growth at more efficient costs. The result of this is a successful, integrated, transportation system of which clients and the management and staff can be proud. The Health, Safety and Environment policies of our business go above and beyond the legislative requirements of the industry. This is not only done as a contractual obligation but in the passionate belief that our duty is the utmost safety and comfort of our passengers and staff. The company prides itself on its overall performance and ability to provide innovative and cost effective services to the general public whilst simultaneously maintaining a mutually rewarding working environment for our staff. Through a process of continuous improvement, Emerald Coaches maintains a modern, well-equipped fleet. Maintenance of all vehicles is carried out in modern workshop facilities, by fully qualified mechanical teams using the latest technology.